For general ventilation control use only. Do not use to control the flow of hazardous, corrosive, flammable or explosive materials and vapors. Never expose this product to temperatures exceeding 140°F (60°C). Always leave this product accessible for maintenance, cleaning and repair. Before installing or servicing this product, switch power off at the service panel and lock service to prevent power from being switched on accidentally. Suncourt® Inc. assumes no responsibility for the installation of the ZoneMaster™. Suncourt® does not provide electrical connection information beyond what is provided herein. If in doubt, contact a competent contractor. For your safety and protection follow all instructions and adhere to applicable building and electrical codes. To reduce the risk of fire, electric shock or injury to persons, observe all instructions. The ZoneMaster™ has been designed to operate on 24 Volt AC, 60 Hz. The only 110/120 Volt AC connection needed is for the power supply Transformer. Before installing the Transformer, confirm that the electric power is off at the junction box where you will be making the Transformer 110/120 Volt connections. Maintain a minimum clearance of 4” (10 cm) from any combustible material or surface to the Transformer and/or the ZoneMaster™ electric motor. This damper is designed to control the flow of heated or cooled air in air distribution systems only. Never close more than 20% of the total air distribution system at a time. The restricted airflow through a furnace or air handler may cause damage to the air delivery and /or air conditioning equipment. This damper must never be used to control the flow of combustion air, flue gas or other toxic or hazardous gases or applications where failure of the damper can cause damage to persons, property or equipment and/or create a risk of fire, suffocation or death. A standard low voltage Heat-Cool wall thermostat, designed for gas furnaces. Electrical wire, 2-conductor, 20 Gauge (CL-2 or Bell Wire) to connect the Transformer to the Damper via the wall thermostat. If the total length of wire exceeds 80 feet (25 m), use 18 gauge wire. If two or more Dampers are wired in parallel (maximum 2 Dampers per each included 15 VA Transformer), use 18 gauge wire. A cover plate with knockout for the electrical box that the Transformer will be mounted on. If you are mounting the Damper between floor joists in flexible duct, you will need two duct supports. The ZoneMaster™ will allow you to individually control the temperature of a room in your home. e.g. An unused room does not have to be heated or cooled to the same temperature as the remainder of the home. In the winter you may want a bedroom a little cooler than the rest of the home. The baby’s room you may want a little warmer than the rest of the home in the summertime. You control your comfort and save significantly on energy use. Choose a normally closed Damper (ZCxxx) if you want the airflow restricted when the Damper is un-powered. This is typical for the thermostatic control. Choose a normally open Damper (ZOxxx) if you want the airflow restricted when the Damper is powered. Consult the Wiring Diagram when planning the installation. 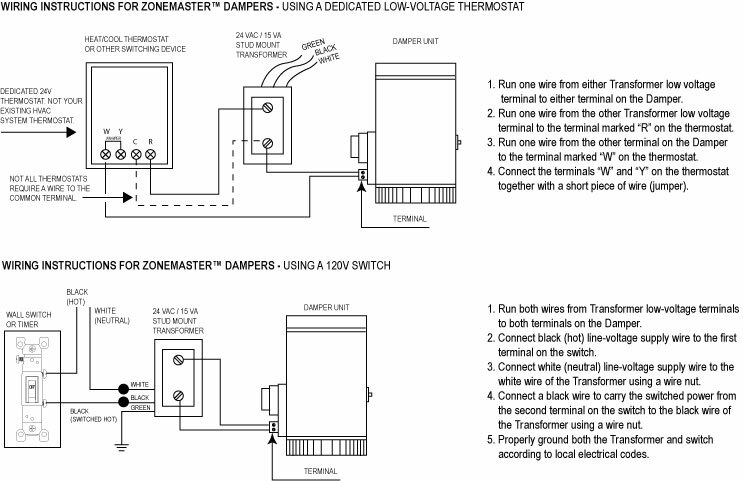 Begin by determining the location of the Damper, the thermostat and the Low Voltage Transformer. Then determine the route you will be running the wires from the Transformer to the thermostat and onwards to the Damper. Once you have this planned, proceed as follows. For metal duct, remove a 6” (15 cm) section of duct at an existing joint so you will have one crimped duct end and one straight duct end. Slide the Damper unit in place so that the ends are inserted at least 1” (2.5 cm) at each end. The crimped duct work end should be inserted no more than 2" inside the female end of the Damper or it may interfere with the Damper plate. The Damper is non-directional so it may be installed facing either direction of the airflow. Rotate the Damper so that you can easily access the electric terminal block. Complete the installation by securing the Damper with the #6 sheet metal screws supplied. Finish the installation by covering the seams in the duct with a good quality aluminum foil duct tape. For flexible duct, cut the flexible duct and slide the ends over the ends of the Damper unit. You will need to support the Damper with a couple of standard duct supports available at Home Centers. Complete the installation by securing the Damper to the flexible duct with a good quality aluminum foil duct tape or nylon cable ties. Take care to ensure that the outer jacket and insulation do not interfere with the Damper mechanism. Make sure that the chosen method to secure the Damper to the duct does not deform the body of the Damper pipe. If the Damper pipe is severely “out of round”, the spring return mechanism may not function properly. The thermostat should be located within the space served by the vent(s) who’s airflow is controlled by the new Damper(s). Mark the location of the thermostat mounting hole in the back plate of the thermostat and install the fastening hardware normally supplied with the thermostat. Do not mount the thermostat on an outside wall. Locate the thermostat approximately 5’ (1.5 m) above the floor and away from drafts and direct sunlight. DO NOT screw the thermostat to the wall at this time. IMPORTANT WARNING: Locate the breaker on your house power panel that controls the 110/120 Volt AC supply to the wires in the junction box that you selected to mount the Transformer on. Use a voltage detector, voltmeter or other suitable instrument to make sure that all power to that junction box is OFF. Identify an existing wiring junction box near the location desired. Verify that the correct wires are available in this box. There needs to be: Black wire (line or hot), White wire (neutral) and a Green or bare copper wire (ground). The cover plate of that junction box must have a “knockout”. This “knockout” must be removed to make the hole for the stud of the Transformer to mount through. Thread the Transformer leads through the hole and securely mount the Transformer to the cover plate. Tighten the nut snug only. WARNING: Over-tightening will break the plastic stud of the Transformer. DO NOT connect the Transformer wires at this time. Low voltage wiring: Refer to the wiring diagram below for electrical connections. It is recommended that you leave at least 1’ (30 cm) of slack wire at each component wired to ease future servicing. The low-voltage wiring is not polarity sensitive. Connect either screw on terminal block to either screw on transformer. The thermostat or low-voltage switching device can be inserted on either side. UP TO TWO DAMPERS CAN BE POWERED BY EACH TRANSFORMER BY EITHER WIRING BOTH DAMPERS IN PARALLEL TO THE TRANSFORMER TERMINALS, OR WIRING THE SECOND DAMPER IN PARALLEL TO THE FIRST DAMPER’S TERMINALS. Screw the thermostat to the wall. Connect the Transformer 110/120 Volt wires inside the junction box. See IMPORTANT WARNINGS above! Connect the GREEN wire from the Transformer to the GREEN or bare copper wire inside the junction box. Connect the WHITE wire of the Transformer to the WHITE wire inside the junction box. Connect the BLACK wire of the Transformer to the BLACK wire inside the junction box. Place the cover (with the Transformer mounted to it) on the junction box, making sure that no wires are pinched between the cover and the junction box. Now review your installation. If you are positive that everything has been installed safely and securely, you may turn on the breaker on your house power panel. Suncourt® recommends that you clean your damper at regular intervals to keep it free from lint, dust and debris. The damper must never be exposed to temperatures over 140°F (60°C). Set the switch on the thermostat marked 'ON-AUTO' , 'ON-OFF-AUTO', 'ON-OFF' or similar wording, to the 'ON or AUTO' position. Heating Season: Set the thermostat to 'HEAT'. Then adjust the thermostat to the chosen temperature (e.g. 55°F). As long as the temperature in the room is 55°F or higher, the damper will be closed. If the temperature in the room falls below 55°F, the damper will open and the room will now receive heated air when the furnace is running. Cooling Season: Set the thermostat to 'COOL'. Then adjust the thermostat to the chosen temperature (e.g. 85°F). As long as the temperature in the room is 85°F or lower, the damper will remain closed. If the temperature in the room goes higher than 85°F, the damper will open and the room will now receive cooled air when the central air conditioner is running. 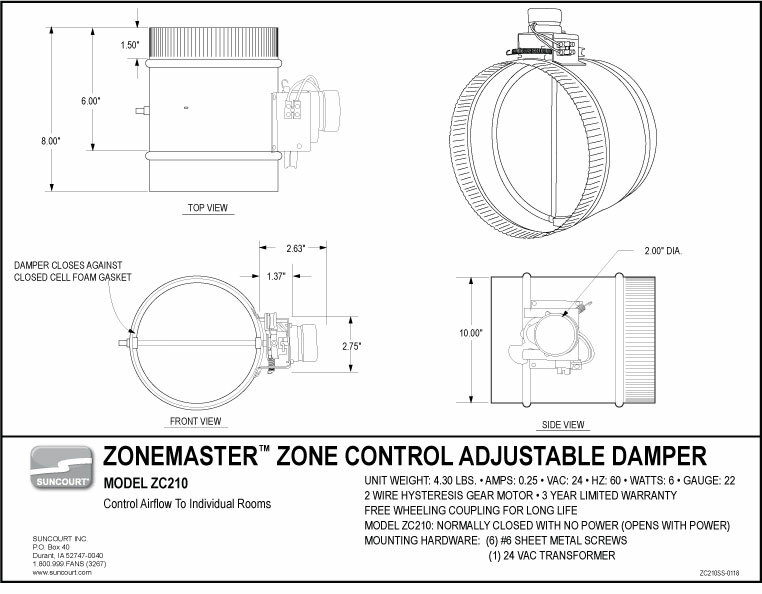 Subject to the following limitations, Suncourt Inc. (manufacturer) warrants that the ZoneMaster™ Motorized Adjustable Damper will, for 3 (three) years from date of original retail purchase, remain free from appearance of defects in workmanship or materials. This warranty is subject to the following limitations: (a) manufacturer’s liability is limited to the replacement or repair of the unit, as decided by the manufacturer; (b) a defective unit must be returned, prepaid, with proof of purchase, well packaged to avoid damage in transit; and (c) this warranty does not apply to defects resulting from the alteration, abuse, accidental damage, unauthorized repair, or misuse of the unit. This warranty is given in lieu of all other warranties, guarantees, and conditions on manufacturer’s part, and the manufacturer shall have no tortious or other liability in respect to this ZoneMaster™ Motorized Adjustable Damper. Ship unit to Suncourt Inc. only after obtaining a Return Goods Authorization (RGA) number. Returns without this RGA number will not be accepted. The amount of airflow through the Zone Master Motorized Adjustable Damper in either the powered or unpowered position can be adjusted by changing the final or initial position (angle) of the damper plate. The position of the damper plate is controlled by the coupler mechanism. When the unit is powered, the motor will rotate the coupler mechanism counter-clockwise until the final “powered” plate position is reached. Once power is removed, a spring will pull the coupler mechanism clockwise until the plate is returned to the initial “unpowered” position. ZC***: Normally closed. Power-open, spring close. ZO***: Normally open. Power-close, spring open. 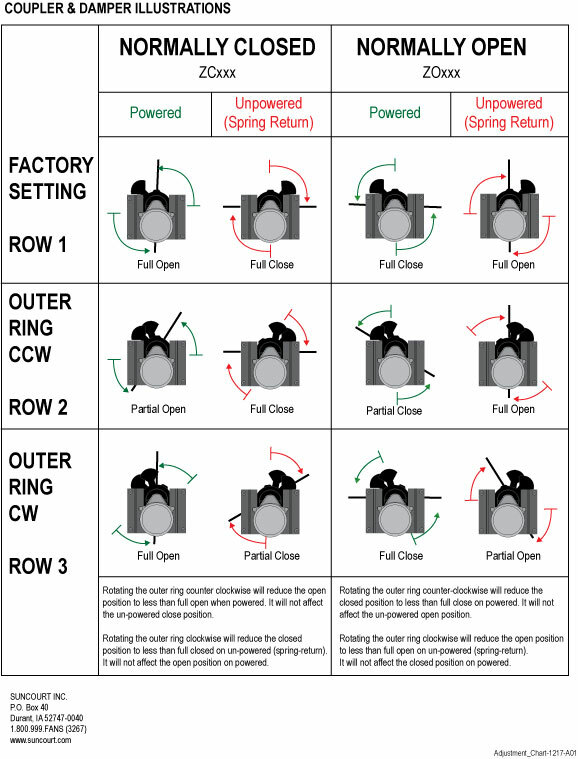 The unit is configured at the factory for 100% open and closed plate positions (see row 1 of the table on the last page). Determine if you wish to change the plate position when powered or unpowered. Repositioning the Outer Ring counter-clockwise will alter the plate position when powered and leave the unpowered plate position unaffected. (See row 2 of the table on the last page). Repositioning the Outer Ring clockwise will alter the plate position when unpowered and leave the powered plate position unaffected. (See row 3 of the table on the last page). The extent of outer ring rotation will directly correlate to the change in plate position angle when powered or unpowered. A ZC*** damper with more CCW Outer Ring rotation will be less open when powered and fully closed when unpowered. A ZC*** damper with more CW Outer Ring rotation will be less closed when unpowered and fully open when powered. A ZO*** damper with more CCW Outer Ring rotation will be less closed when powered and fully open when unpowered. A ZO*** damper with more CW Outer Ring rotation will be less open when unpowered and fully closed when powered. Detach the spring from the motor bracket. Make note of the excess spring length below the bracket. This is important in setting the proper spring return force. Loosen the set screw in the Outer Ring and remove. Move the screw to the boss on the right side of the Outer Arm, but do not tighten fully. Rotate the plate to the intended open position using the Inner Arm. While maintaining the intended plate position, rotate the Outer Arm counter-clockwise until it contacts the motor bracket. Make sure that the Outer Ring is fully seated on the Inner Ring and tighten the set screw until it is ‘seated’. Do not overtighten the set screw. Never use a powered drill driver. Reattach the spring to the motor bracket. Ensure that the spring has the correct excess length as noted above. Loosen the set screw in the Outer Ring until the Outer Ring can freely rotate independent of the Inner Ring. Rotate the plate to the intended closed position using the Inner Arm. While maintaining the intended plate position, rotate the Outer Arm clockwise until it contacts the motor bracket. 12.25" 10.25" 9" 2 19.25" 12.75" 13.25"